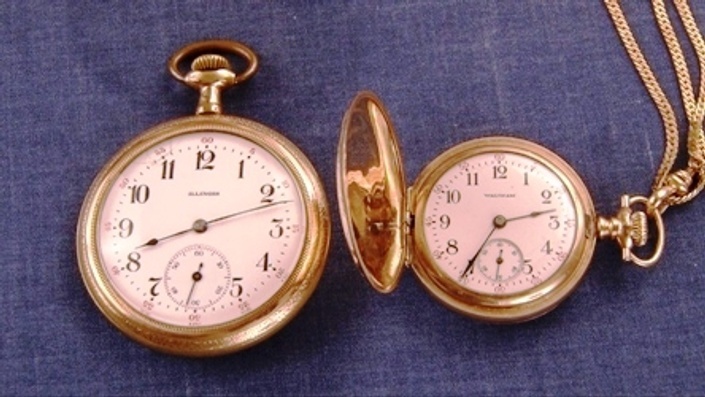 Do you enjoy antique mechanical clocks and watches as a hobby? Do you like to work with mechanical devices? Would you like to learn a new skill or trade? Mentor others? Restore a family heirloom? Do you want to start a part time or full time business of repair and restoration of clocks and watches? The Tick Tock Productions Online School of detailed instruction is for you. The demand for people who can repair clocks and watches is very high. No previous clock or watch repair experience needed. The school has 9 training courses. Most of the training courses consist of 12-16 video instruction modules. Each module is approximately 15 to 20 minutes in length. 8 of the courses include a course training manual. You can earn a course completion certificate upon 100% completion of each course. There are a total of 9 course certificates that can be earned. Plus there is an online library consisting of over 100 classic and rare watch and clock repair books. 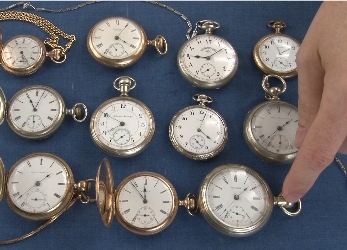 The online library also contains more watch and clock videos. These courses are designed for the new beginner or hobbyist through a professional level. There are no other clock and watch repair video courses available with this amount of instruction and detail. All lessons are filmed in high quality digital video with an easy to follow step by step approach guides you quickly through the basics and through intermediate level repairs. This course includes many details, techniques and tips not normally covered in other books or courses. No more confusing and hard to understand books and manuals. 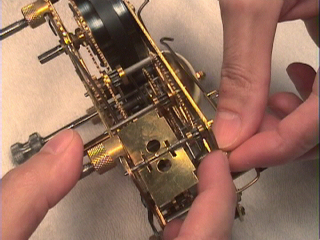 See and understand with close up shots of actual watch and clock repairs. Learn with minimal and common tools. 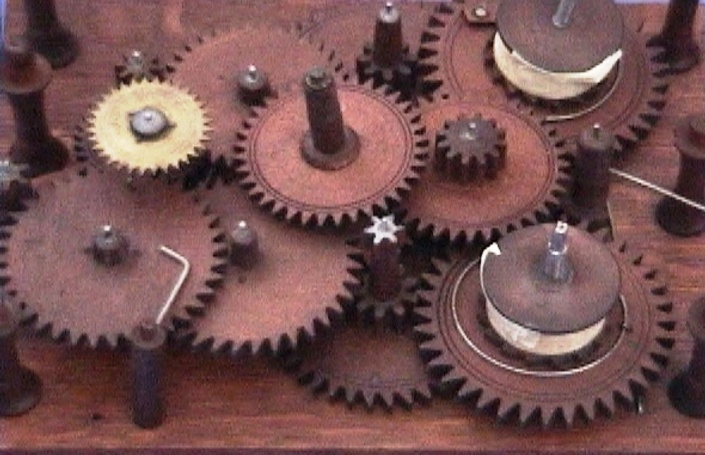 Many of the tools are adapted for clock or watch repair from everyday ordinary tools. Not a lot of expensive equipment. Available resources for tools and parts are provided in the course manuals. The 8 detailed course repair manuals are full of additional tips, illustrations and diagrams. All tools, materials, and equipment used in theses video courses are listed in each manual for easy reference to model, make, price, and where they can be purchased. An extensive clock and watch repair library. 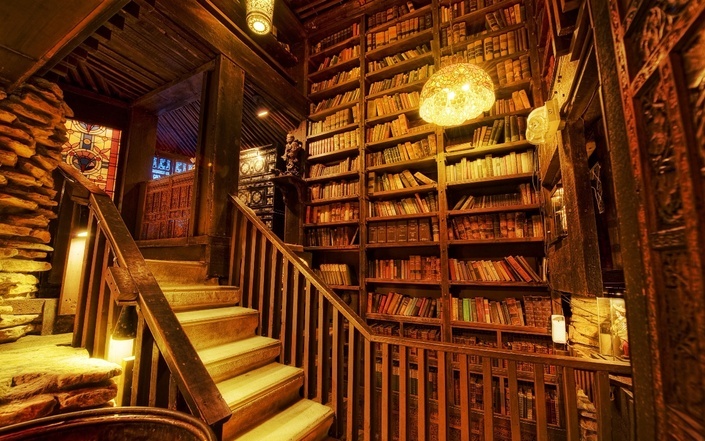 There are over 100 titles. More titles will be added. Any new books and videos are immediately available to every student enrolled in the entire school. All course updates are immediately made available to all the students enrolled in the entire school. You will always have the most current information and resources. Everything in the Tick Tock Productions Online School is available to you 24/7. You will have lifetime access. Your courses are fully responsive so that you can view any course content on any device. All the courses below are bundled for a special priced enrollment. Click to enroll at the top of this page for the special priced enrollment bundle. Each course below can be purchased individually for $89. How long do I have access to the school courses and library after enrollment? After enrolling, you have a lifetime of unlimited access to the entire school and unlimited updates. Enrollment includes all courses, all manuals and entire school library! View and learn across any and all devices you own: Computers, Smart TVs, laptops, tablets and smart phones. Can I enroll in only 1 course? Yes, each on-line course can be purchased separately for $89. The school starts now and never ends! It is a completely self-paced online course - you decide when you start and when you finish. I would never want you to be unhappy! If you are unsatisfied with your purchase, contact us in the first 48 hours and we will give you a full refund. Are the courses still available on DVDs? Yes. Each course of DVDs is still available for sale from the Tick Tock Productions web site including the printed course manuals. Each course is $99.95. Free shipping worldwide! Why learn with videos versus the classroom or only books? A picture is worth a thousand words, but a demonstration through video is worth a million words! The Research Institute of America has found that in 33 minutes after completion of a classroom course, students retain only 58 percent of the material covered in the class. By the second day, 33 percent is retained, and three weeks after the course, only 15 percent of the knowledge delivered is retained. Separate studies further support these findings, in which it was reported that 87 percent of the learning from any given classroom workshop is lost within 30 days if not followed up. A video lecture can be stopped, rewound, and watched again until the student grasps the content. I am enjoying my recent purchase of your new programs. I can now fully enjoy my hobby of antique clock collecting and completing simple repairs. Having taught Forensic Science Chemistry and Serology on the college level, I want to commend Tick Tock Productions (John) on the sequential presentation, clarity, depth, and professional manner of the presented material. I look forward to future programs to be offered. I will HIGHLY RECOMMEND the programs to the local members of my local chapter members and friends. Sincerely, Robert - NAWCC #0040542. "I have to tell you I received the beginner course the other day and watched it. You are a genius! I was impressed with the way you taught the course. You kept me interested through the whole course. I never got bored. The information was well taught and I have already taken my first clock apart and back together with great success. I am new to this hobby and you have done it a great justice by teaching these skills that are being lost.I will be buying the other courses as time goes on.The smartest money I have ever spent. Thanks," Craig from CT.
"I hope this message finds its way to John as I really want to thank him for inspiring me to proceed with Horology. He is the ONLY instructor out there doing this. His promotion of this profession is second to none. I have purchased most of his DVD's and will be purchasing the lathe series next. I have fixed several clocks now and have grown in confidence all the more. John, keep doing what you are doing. I wish you had a newsletter I could subscribe to. Also, will new DVD's be out soon. Thanks." Jeff from U.S.A.
"I am really learning a great deal from the John's work. I retired from teaching history and have too much time on my hands-no pun intended. Recently took a course at NAWCC - I live near Hershey PA near to NAWCC Headquarters and have been developing an interest in horology. "John's instruction is great and quite a bargain considering the extent to which he covers watch maintenance and repair. In a short time I have acquired many tools, watches and an ultrasonic. Now, I guess, its a matter of study and developing skills. As I said the videos are helping quite a lot. I'm very glad that I found them. Please thank John for me because I really appreciate the time and effort it took to produce them." Bill from U.S.A.
"So far the course is great. I had taken a course many years ago from "The School of Clock Repair", and the DVDs show a lot that I had missed. I am looking forward to finishing the courses and starting my new "retirement" vocation." Dennis from IL. "John - A few months back I rescued an old clock, (Ansonia Linscott) from the trash and thought to myself, golly, I wonder if I could fix that. I watched your first video and I was hooked. What a wonderful job you have done. I got the thing running and now have taken apart my second antique clock, and as I just began watching your Advanced Clock Repair, I just went whole- hog and ordered a Sherline lathe. That's how much of an influence your video series has been on me. You have really changed my life. Thanks for a job well done my friend! Best to you in 2016." Rich CA. U.S.A.
"I am a new student of your Clock Repair 1 & 2 training course - I'm very pleased with the level of detail covered in the training." Terry from U.S.A. I enjoyed your DVD course enormously and thought I would let you know that I got all my clocks cleaned up and running again. They are all ticking away and I have managed to adjust them to keep pretty much perfect time. Your presentation on the DVDs was clear, concise and relevant to all the cleaning and repairs I needed to do. Thank you so much for leading me to my favourite new hobby! All I have to do now is to find some more clocks to fix." Best Wishes, Peter from London. "After recently buying the first DVD set I just wanted to say how great this beginner course has been, just what I was looking for. Thanks for a great start into a possible new career." David from UK. Okay John, sorry for being long winded but I do love talking shop. I hope to meet you in person someday and of course if you find yourself coming to Nashville, please call and dinner is on me…." ON CLOCK REPAIR FOR BEGINNERS 1/2. AND A LOT EASIER TO UNDERSTAND WHILST WATCHING A PRO DO IT. 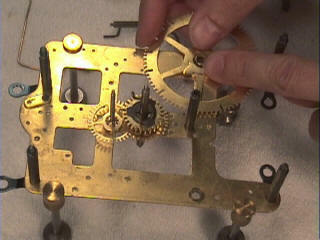 MOST OF THE REPAIRS I'VE DONE ON CLOCK MOVEMENTS HAS BEEN BY BOOKS. AND A LOT OF TRIAL AND ERROR TILL I GOT IT RIGHT. I WAS THAT IMPRESSED WITH THE FIRST PURCHASE I HAD TO ORDER THE DVDS ON CLOCK CASE RESTORATIONS. I KNOW THE MORE KNOWLEDGEABLE I GET ON THIS SUBJECT THE MORE I WILL PURCHASING YOUR GREAT DVDS . SO ONCE AGAIN THANK YOU AND KEEP UP THE GREAT WORK YOU ARE DOING.
" I have purchased every set of Mr. Tope's Clock Training, Advanced Training, Wooden Movement repair, Lathe Operations and Case Restoration and Repair. Some purchased a while ago; some in 2008. I have recently retired full time and started to utilize the DVD's. As far as I am concerned, THEY ARE THE BEST ON THE MARKET FROM EVERY ASPECT." 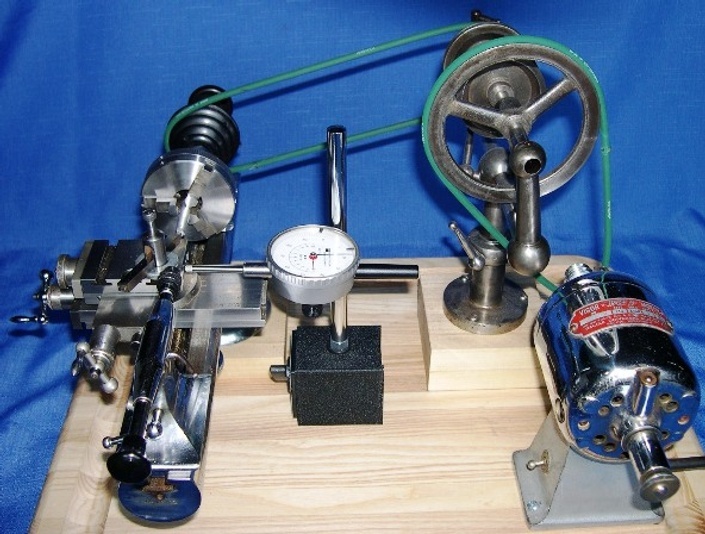 Robert from CT.
"I recently bought your watch making course, and your watchmakers lathe courses (Basics and Projects). I've enjoyed the first two enormously, I haven't made a start on the third yet. I had already been studying from books and experimenting by myself for a couple of months before I got your videos, but I was really feeling the need to compare notes with another live human being, unfortunately I was unable to find any clubs etc in my area. Your videos come close to being a substitute. I particularly enjoyed that the videos were not too heavily edited: if something went wrong you described the recovery then carried on. This is very reassuring because it means I needn't feel like an idiot when something goes wrong for me as well. I haven't said much about the lathe courses, but I found your segment on disassembling, cleaning and maintenance of the headstock particularly valuable. Where else can I find this info? I really have no idea. All of my lathe books describe operation and accessories etc, none describe maintenance (except one book which suggests sending it back to the mfr for servicing. Hah!). I had no idea that the headstock even needed oiling until I watched your video! In short, please keep 'em coming!" Don from U.S.A.
"I have been watching your clock repair videos with absolute awe and wonder. I have watched the first in the series, Clock Repair 1 & 2. Perfect. I've watched the second in the series. Wonderful. You don't know how much a godsend you are. My dear Father had a clock that he loved and played with. My last memory of him is doing something with a nail on his jewelers lathe to fix his clock. There were 17 ruined nails in a pile...When he died, the clock was working, but it wasn't totally reassembled. That was 4 years ago. Thanks to you, and your instruction, I will hopefully be able to fix his clock. I have his jewelers lathe, the parts and pieces, the calipers and a lot of the tools of which you speak. Do you know what my dad could have done with your video instruction? It boggles the mind because I do think he was doing things the hard way. Thank you." Margaret from U.S.A.
"I have purchased your first two courses and finished course one. It was terrific and I am working on a couple of clocks now." Rodger from U.S.A.
"I've been able to disassemble and reassemble the works several times. I'm truly impressed with your videos since I have no previous experience in clock repair." Bob from U.S.A.
Just wanted you to know that I just got through watching the DVD's on clock case restoration. What a wealth of information!! I really appreciate all the information. Just wanted you to know how much I appreciated these videos. Thanks again!" Cindy from Kansas. "Thanks for another superb clock course!" 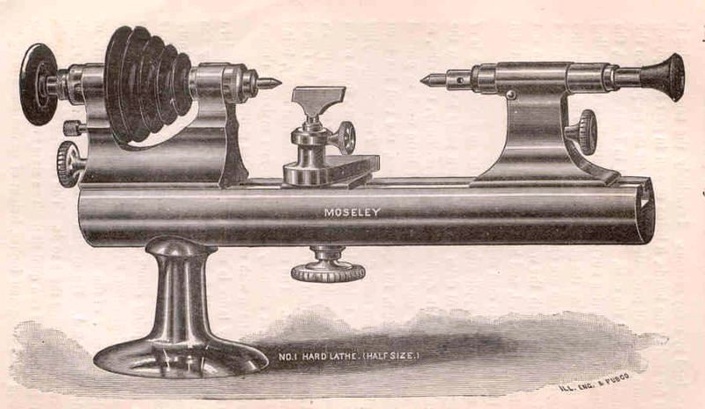 Joe from U.S.A.
"Dear John, I very recently bought your lathe basics course and must congratulate you on the quality; I'm really enjoying the course and am looking forward to being able to advance to the intermediate course. Many thanks in advance for your assistance and for your inspiring course material (you make it look too easy!)" Mark from U.K.
"Excellent training. Very detailed with excellent filming to give hands on experience. I couldn't be more pleased with the set of 4 DVDs. John knows how to get down to the details that are required to properly repair clocks. He also teaches many of those important items learned through experience that are not in the books. So very professional with extremely clear visuals and verbal explanations. Like working beside John as he goes through his teaching." Frank from U.S.A.
"Started watching and could not stop - great material delivered very timely. Frank from FL. "I ordered your Clock Repair 1 and 2, and was very impressed with the video. It has proven to be very helpful. I just placed an order for your Advanced Clock Repair. Looking forward to watching your Advanced clock repair." Neil from U.S.A.
"Good production, lighting and close up work well though out. John Tope is knowledgeable and articulate. Clock Repair 1 and 2 was well done, quite informative, and very well lighted. Close ups are sharp and well thought out. Dialog is kept simple and direct to the subject. Too many teachers love to hear themselves talk. I like John's minimizing the need for expensive tools if it can be done more economically." Ralph from U.S.A.
much we enjoy the material, it's been a great help." Chris from U.S.A.
"Just a line to say that the Clock Restoration Course arrived yesterday and from what we have seen so far, another winner. Thank you so much for the brilliant service." Margaret from U.K.
"Hey John, Just wanted to tell you that I finished watching the DVDs, and feel like you taught me a lot about clock repair. I am glad you went through TOTAL dismantling and reassembling of a movement. My wife got me into it. Her father was really good at fixing old clocks. He learned from his father. So we decided to buy him a Gilbert clock as a present, and I was winding it, and the mainspring broke. I was going to give him a clock and a project (which he would like). None of his 5 kids are really interested in clock repair. This past Christmas he and I started talking about clocks. When my wife and I decided to get him the clock. I started getting excited about clock repair. He was going to start teaching me about how to fix clocks. We talked a lot on the phone, and he did teach me a little. Unfortunately, both he and my mother in law were killed in an auto accident the day before his birthday just a few weeks back. After awhile, I decided to try to learn enough about clocks to repair that Gilbert we had gotten for him. I feel it's something I want to do for him. He had previously given us a clock and given clocks to all of his other children. Now the family is kinda looking to me to learn enough to keep them all running. I just thought you might want to know that your courses on repair have given me the confidence to say, "I think I can do it!!" Thanks a bunch!!" Chris from U.S.A.
"Very clear, thorough treatment. Good photography--I appreciated the close-ups." Christopher from U.S.A.
"I enjoyed your quality DVD Clock Repair 1&2 course that I bought from you in February 2004 and look forward to the next one I just purchased. Great Job! Thanks!" Mike from U.S.A.
"Great Video. Very informative. Good descriptions and camera work. A great intro for a complete beginner (me)." Michael from U.S.A.
"Mr. Tope. The clock repair program has helped me a lot, and I want to thank you." Shelby from U.S.A.
"An excellent intro video to clock repair. John's open and down to earth style of presentation make you feel like not are you learning but also right there and his best friend and assistant. John opens the door to a new world of challenges for the beginner without over-whelming the viewer. As a "newby" myself, His detail is sufficient to allow you to understand the breakout on a clock but yet realize that clock repair is either something you have an aptitude for or not." Mark from U.S.A. I got the clock courses and I'm thrilled! I had previously gotten the basic course in 2006 and loved it. I know that eventually I'll end up with all of them. I followed up with positive feedback on all of them for you. I know I'll be back! Have a great day. Thank you again for making this very valuable information affordable and so detailed. It is a tremendous help when trying to maintain my clock collection." Valerie from U.S.A.
"Thank you so much for the wonderful course on clock repair. The production was wonderful and I should know because I work as the Creative Services Director for a television station. I have always wanted to learn clock repair and I have you to thank for starting me on this exciting and fun journey. As soon as I gain a little more experience on repairing clocks I am going to order you next two courses. I really did find them fascinating. 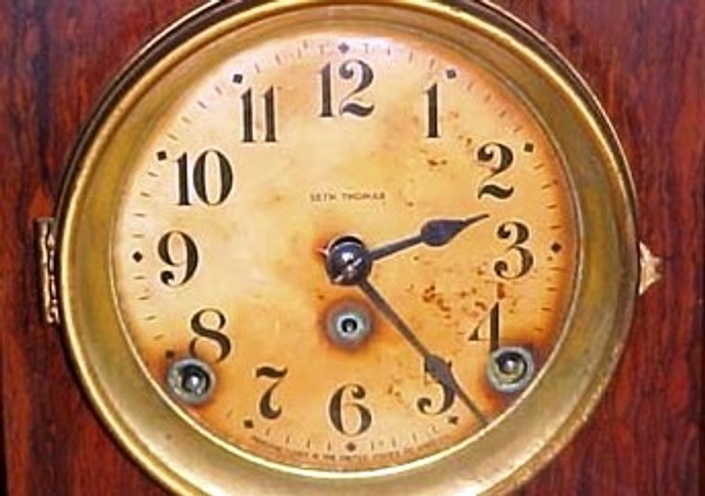 Thanks again for a GREAT course and sharing your clock restoration secrets." Dennis from U.S.A.
"I purchased your Clock Repair 1 & 2 about 6 months ago... I have really learned so much. I am on my second time viewing and each time I see something I didn't see or understand from the first viewing. Great Job! Thanks, John! It's a pleasure learning from you!" Jean from U.S.A. "P.S. I just recently joined the NAWCC because of your involvement. Just to let you know!" "I am finding your clock courses FANTASTIC!!!! Thank you very much." Gary from U.S.A.
"Excellent repair course. (Clock Repair 1 and 2) Easy enough for the beginner to understand yet thorough enough to move one further up the ladder of experience. I highly recommend it.This part of the four part set of training DVD's was a continuation of well produced, real life examples and solutions to professionally repair the mechanical movements of the older clocks. I short, four excellent training DVD's. "This was the final DVD of the 4 DVD set on Professional Clock Repair. It was just as full of interesting information as the first DVD's. 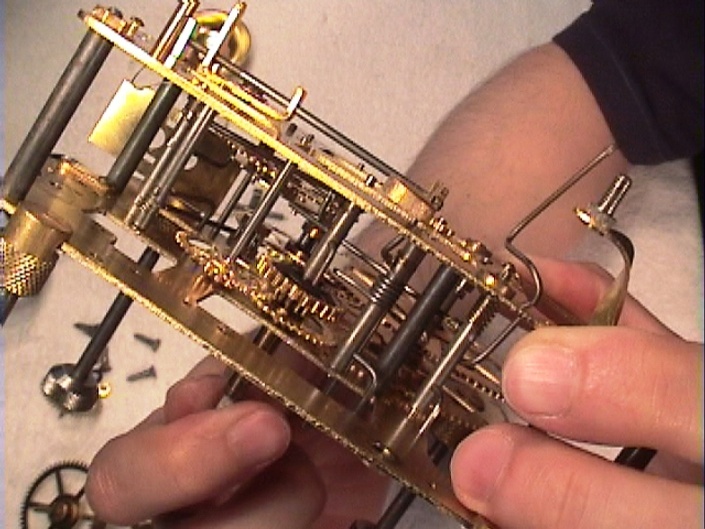 John Tope produces the finest clock repair DVD's I have ever viewed. These are the type of training DVD's that one can review over and over and still learn something new with each viewing." Jake from GA.
"I received the DVDs today and was nicely surprised with the presentation and overall quality of the product. I expect to purchase more as I work through them." Chuck from U.S.A.
"Thought the clock works DVD was very well done and a wealth of information. I hope to get the next set of clock repair DVD soon. Thanks Patrick" Patrick from U.S.A.
"Clock repair is almost a lost trade there is not that many clock repair tradesmen doing it any more mostly because a lot of old-time clock repair men have passed away or they are to old and cannot continue doing repairs. Times have changed and we live in a throwaway world where you buy a new clock and if it stops running you just throw it away and buy new one. There is still a lot of clocks out there that people want to have repaired this is why we have to keep this trade going. This is my first time watching a course on clock repair. I am glad that John has made these courses to get a new generation of clock repair people interested again in the trade. John tope has done a good job with this advanced course. This course on Advanced clock repair has good techniques and gives you step-by-step procedures on repairs. 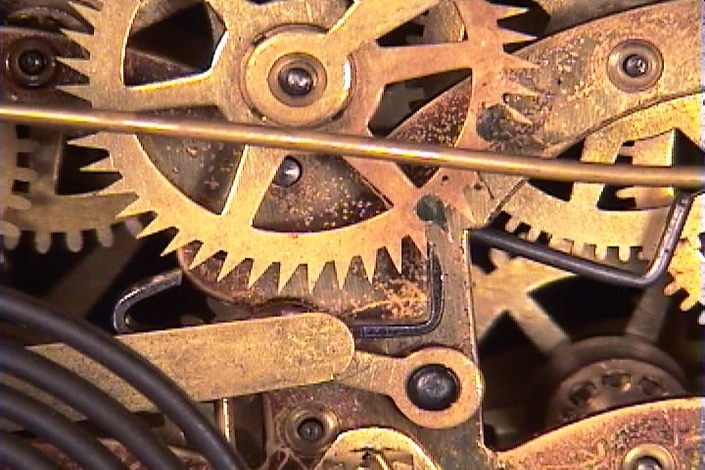 This course is for someone that has already some knowledge of clock repair, you must already know how to completely take apart and reassemble a clock before going through this course. I recommend it and if you already know how to do some of the repairs on this course it is always a good opportunity to watch a other clock repair person to get their techniques to make you more knowledgeable for repairs. I look forward to watching his other clock courses." William from U.S.A.
"As starting out in clock repair, I recently purchased you Clock Repair 1 & 2 and thought it was great! I repaired my first movement and it actually worked!" Russell from U.S.A.
"Another great repair course by John Tope. 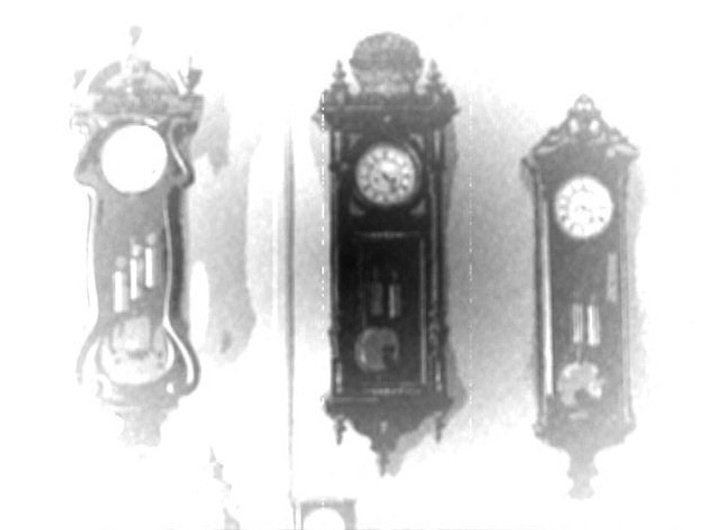 The Wooden Movement Clock repair course - all four DVD's - took away all of the worry, for me, regarding these old wood movements. Another professional production by John filled with useful tips, troubleshooting and repair information." Jake from GA.
"I've watched 2 tapes the first night. Can't wait to get started! I have three Terry type movements now in various states of repair. Now I have a much better insight on the movements. Until now I have found very little on the repair of these WW movements." Mark from U.S.A.
"Congratulations on an outstanding job of training. I bought 2 courses and I can tell you that I thought they were better than any suitcase class I have ever had at the NAWCC. Great job! It was worth the money!" Art from WA. "I cannot thank you enough for the great videos you produce. The wealth of knowledge has saved me a hundred times what I would have had to fork out to a professional clock repairman. Explained in layman's terms your videos are easy to follow with countless money saving tips on tools, books, etc. 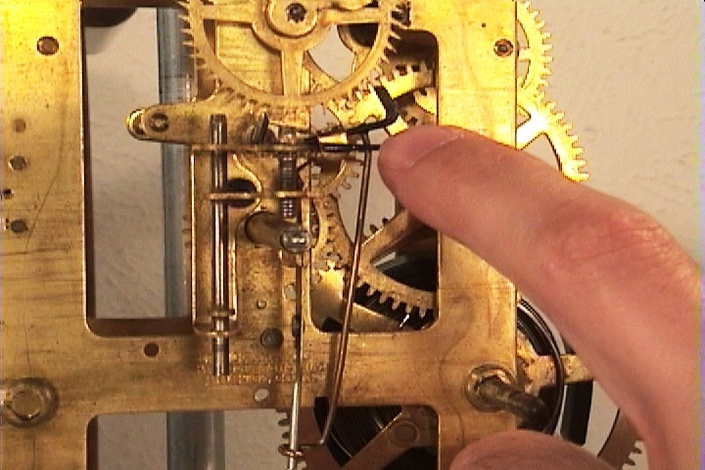 I am simply amazed that someone like myself with limited mechanical knowledge, but a sincere desire to learn, can actually repair clocks 80+ years old following your step-by-step procedure." Eric from Japan. "WEALTH of information!!! Excellent video!!!! Thank you John!!!!!!!" Kathy from U.S.A.
"I received the tapes for Clock Repair 1 and 2. I have viewed them both with great interest. Thank you VERY MUCH for taking the time to put together such a thoughtfully presented, detailed and non-condescending video course. I plan to watch them again!" 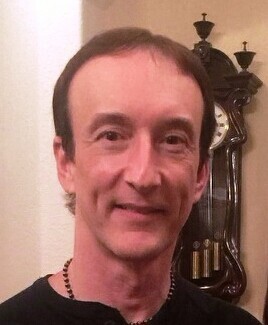 Joe from California. "I just wanted to let you know I just finally had time to watch your video. It was EXCELLENT!! It was very down to earth and easy to follow!! I will be ordering the advanced video soon." Peggy from U.S.A.
"The videos are fantastic. HIGHLY RECOMMENDED." William from U.S.A.
"Great stuff you can learn from these tapes. I will buy from you again. Thanks John." Greg from U.S.A.
"John, first let me say "THANK YOU" for your videos. I was a bit apprehensive about spending the money for all 3 courses, but I am simply delighted that I did. I have already gone through the first 2 courses and have found myself replaying particular parts over again to get the specifics down correctly. Well done thanks!" John from ME. "FANTASTIC HOME CLOCK REPAIR PROGRAM. THANKS A BUNCH!" Debra from U.S.A. I would like to thank you for those wonderful instructional DVD's about clock repair. I believe no class could have explained and demonstrated things better than your DVD's. They are very helpful and educating." Thomas from U.S.A. The school includes all 9 clock and watch training courses and the library. 8 course manuals. The training courses consist of over 120 video instruction modules. Each module is approximately 15-20 minutes in length. Your enrollment never expires! PLUS: All access to the online school library consisting of over 100 classic and rare watch and clock repair books and other clock and watch videos. More titles to be added. All the courses on DVD with printed manuals. Plus the online school which has all of the clock and watch training courses. 8 on-line course manuals. The training courses consist of 120 video instruction modules. Your online enrollment never expires. All access to the online school library consisting of over 100 classic and rare watch and clock repair books and other clock and watch videos. More titles to be added.